Open to artists living within a 40-mile radius of Glenside, Pennsylvania, "Works on Paper" is distinguished by a selection process in which the juror reviews actual artworks brought to the gallery (as opposed to 35mm slides or digital representations). There are no size restrictions on works brought to the gallery. Works can be hand-delivered on October 29, 30, 31, and November 1, 2009. Entry fees are $15 for one work; $20 for two; $25 for three. View guidelines for more schedule details and further information. Cash prizes totaling up to $2,500 will be awarded to selected entries. Additional prizes include the Philadelphia Museum of Art Award (selected for purchase consideration) and a purchase award for Arcadia University’s permanent collection. Artist’s included in this year’s “Works on Paper” exhibition will also be eligible for consideration for “A Closer Look 8”. This year’s exhibition will be juried by João Ribas (born 1979, Braga, Portugal). Until last month, Ribas was Curator at The Drawing Center (New York City), a position he began in February 2007. This fall he starts his new position as Curator of Exhibitions at the MIT List Visual Arts Center (Cambridge, Massachusetts). His final exhibition at The Drawing Center is a landmark survey of the drawing-based work of Ree Morton (1930-1977). 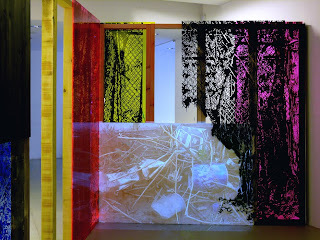 Entitled "Ree Morton: At the Still Point of a Turning World," it will remain on view through December 18, 2009. Feel free to share this e-mail with friends and colleagues. If you would like to receive printed copies of the exhibition guidelines, please phone Jamar Nicholas at 215-572-2133 or write to him at nicholaj@arcadia.edu. Highwire Gallery is actively seeking artists across multiple disciplines including, but not limited to, painting, drawing, printmaking, sculpture, installation, performance, and digital media. We are looking for vibrant new members in any stage of their career who are flexible, motivated and dedicated to their work and to being a part of this artist run co-operative gallery. Please send your Artists Statement, Bio, and 3-5 images (JPGs or a link to your website or other web based images) to highwiregallery@gmail.com. information has been reviewed, you may be invited to bring a selection of original works to the gallery where you will have the opportunity to meet our members, discuss yourself and your work. Highwire Gallery is a non-profit co-op arts venue in the Fishtown section of Philadelphia, featuring monthly visual art exhibits as well as live music, video and performance art. We strive to provide the community with artistic variety and interactive shows to explore the creative process, free of restrictions often found in commercial galleries. • Applicants must live within a 50 mile radius of Philadelphia and cannot be presently enrolled in any undergraduate programs. 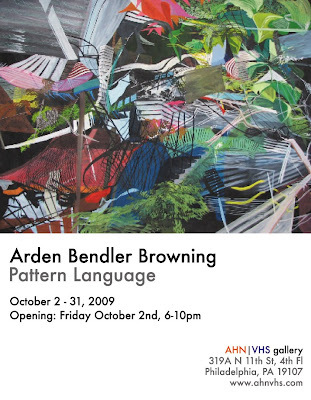 AHN|VHS is pleased to present a solo exhibition of new large-scale works by Arden Bendler Browning. The Philadelphia based artist takes her influence from the city's “dichotomous landscape”. Interweaving imagery of architectural decay and rampant flora, her dynamic compositions emulate the violence and euphoria embedded in the city itself. Bold colors and sharp gestural lines whirl together creating a delicate balance of utter chaos and control. Incorporating the physical elements of construction / destruction sites, these epic works are painted and drawn on Tyvek. Reflecting on the timeless tensions between the built environment and the natural world, these works depict the point of climax in the battle between the two; snapshots of the decisive moment in the most profound conflict, where every line between destruction and creation is blurred. Bendler Browning says she is attracted to cities for their “density, activity, variety, their layered contradictions... the opposite of the picturesque landscape.” Taking inspiration from her immediate urban environment, Bendler Browning spends much of her time taking countless snapshots of the city, capturing the myriad “visual hypocrisies” discovered along these daily explorations. “A silhouette of a blue tarp can become a vibrant colored square rather than mundane construction material; highlighted chips of wall paint from an upturned building add energy rather than depicting gloom.” There is no assigned protagonist or villain here. By highlighting the contradictions inherent in the urban landscape these works evoke the grace and vulgarity of all things contained therein; man-made or organic, both forces hold the potential for good and evil, and both are simultaneously neither/nor. Bendler Browning's images are a lens through which we may watch this puzzle unfold. Arden Bendler Browning received her MFA from the Tyler School School of Art in 2003. Her work was featured in the 2009 edition of New American Paintings. Recent solo exhibitions include “Solo Series 2009” at the Abington Art Center in Jenkintown, PA, curated by Sue Spaid, and “Urban Reef” at the Painted Bride Art Center in Philadelphia, curated by Sean Stoops. Her work has also been included in exhibitions at The State Museum of Pennsylvania, the Delaware Center for Contemporary Art, and Fleisher Ollman Gallery. About AHN|VHS: Gallery owners Julianne Ahn and Lauren van Haaften-Schick are Philadelphia-based artists and arts professionals. In addition to monthly exhibitions AHN|VHS features a curated flat file of works on paper, and editions in all media on our store shelves. All artwork is available for viewing and for sale in the gallery and at www.ahnvhs.com. The Samuel S. Fleisher Art Memorial presents the first exhibition in the thirty-second season of the three-part Wind Challenge Exhibitions at Fleisher — the Delaware Valley's premier juried artist exhibition program. This season's nine Challenge artists were selected from a field of 368 applicants to exhibit in one of three three-person exhibitions. The first of this year's Challenge Exhibitions features a sculpture by Joshua DeMonte, drawings by Sharka Hyland, and an installation Keiko Miyamori. The exhibition begins on Saturday, October 3rd, with an opening reception from 4:00 to 6:00 PM, and continues through November 22nd, 2008. Both the exhibition and the opening reception are free and open to the public. Gallery hours are 10:00 AM to 5:00 PM, Monday through Friday, with additional hours of 5:00 to 9:00 PM, Monday through Thursday, and 10:00 AM to 3:00 PM, Saturday. Joshua DeMonte's work explores the relationship between architecture and environment by translating features of ancient architecture into jewelry and transforming the wearer into the site. His objects are intended to be worn and appreciated, but they are also meant to alter one's perception of the figure. Mr. DeMonte received received both his B.F.A. and M.F.A. from Tyler School of Art, Temple University. Sharka Hyland's paintings and drawings juxtapose her memory of the dense, overlapping European spaces in which she grew up against her experience of America's use of space — tentative, and largely undefined. In her work, Hyland explores how the emotional dimensions of built environments tell vague stories that leave room for speculation. Ms. Hyland received her received her art history degree from École du Louvre and her M.F.A. from Yale University School of Art. For Keiko Miyamori, the charcoal rubbing not only captures a physical mark, but also transfers the “soul” of a natural object. Simplicity, quietness, and a sense of unity ebb and flow in Miyamori's objects and installations, which feature rubbings on Japanese washi paper and clear plastic. They are intended to inspire others to live in harmony with nature. Ms. Miyamori received both her B.F.A. and M.F.A. from the University of Tsukuba. The first Critical Dialogues Visiting Artist Lecture will be this Monday, September 14th, 2009. Cherubini was born in Boston in 1970. She received her BFA in Ceramics from the Rhode Island School of Design and her MFA in Visual Arts from New York University, and later attended the Skowhegan School of Painting and Sculpture in Maine. She is a recipient of an NEA Travel Grant, a New England Foundation for the Arts Fellowship in Sculpture, the Louis Comfort Tiffany Foundation Award, and most recently an Art Matters Grant for travel in Mexico. 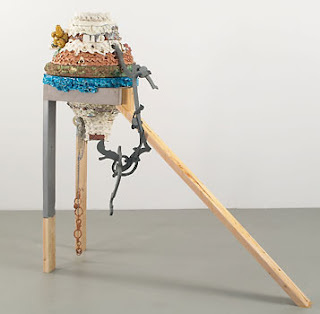 Her work has been exhibited in group and solo exhibitions both internationally and in the United States; including the Institute of Contemporary Art, Philadelphia; the Walker Art Center, Minneapolis; Santa Barbara Contemporary Arts Forum, Santa Barbara, CA; Sculpture Center, New York; La Panadería, Mexico City; PS1/MoMA, New York; The Rose Art Museum, Boston; Samson Projects, Boston; and Galerie Michael Janssen, Berlin. Last fall, she had concurrent exhibitions at Smith Stewart Gallery and D’Amelio Terras in New York. Cherubini lives and works in Brooklyn, New York. We want to invite you to visit the Stella Elkins Gallery (in the basement of the Tyler School of Art, 1201 N 13th St. Philadelphia, PA 19122) where the 2nd Year Grads in Glass, Fibers and Ceramics are exhibiting for the next two weeks. Show is Open from Aug. 26 through Sept. 5 during Gallery hours: Wednesday through Saturday 11am to 6pm. A Closing Reception will be held on Thursday Sept. 3, 5pm to 7pm. Please come check out the work we made this summer!